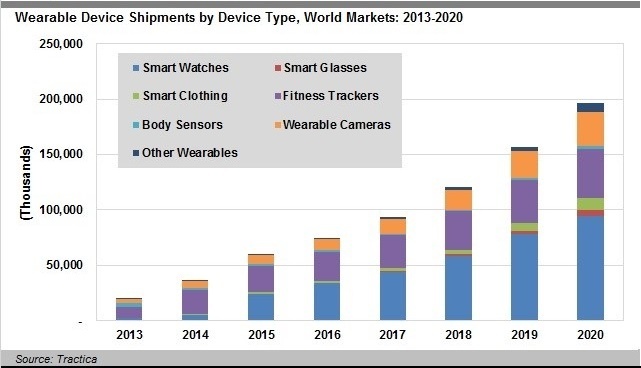 Wearable devices are currently growing hugely in popularity, with predictions that the market will grow to $25 billion by 20191. Many of these devices, like the FitBit or Jawbone, are fairly cheap and affordable to the public. With the rising prevalence of chronic conditions like obesity due to our increasingly sedentary lifestyles, the use of wearable technology is on the up. Although initially marketed to consumers wanting to track their health and fitness, many wearable medical devices are now being designed and their potential use in clinical trials could completely transform and revolutionise the pharmaceutical industry. The obvious benefits to incorporating wearables in clinical trials are a higher compliance rate and reduced dropout rate, because wearing a device to monitor various vital signs and endpoints can reduce the need for hospital visits. For the same reason, clinical trials could have a much higher uptake and recruitment rate. The large amount of additional data could mean a lower variability, so fewer subjects could be needed to achieve statistical power. However, this concept is virtually brand new and has major questions that need to be answered before real progress in this area can begin. Wearable devices can currently measure functions such as sleep, heart rate, gait, velocity, step count, blood pressure and temperature. More sophisticated devices have even more capability, for example measuring oxygen saturation, electrocardiogram (ECG) and glucose2. Some, like the HealthPatch by Vital Connect, can even measure posture and detect falls. Accurate glucose monitoring is something currently in development, as it is not readily available in smartwatches, and several companies are developing prototypes to solve this problem and avoid the need for invasive methods. For example, Dexcom have developed a CGM (continuous glucose monitoring) app which connects to a dermal implant with a tiny wire capable of monitoring blood glucose every five minutes and eliminating the need for finger sticks3. The Freestyle Libre Flash Glucose Monitoring System by Abbott is a wearable skin sensor which has received regulatory approval to be sold in the United States and India and is currently undergoing the FDA approval process. Glucowise are developing a non-invasive glucose monitor, which is a skin sensor placed between the thumb and forefinger taking an accurate blood glucose reading whenever required. The “established” areas currently using wearable devices are the four most prevalent chronic illnesses: congestive heart failure, hypertension, diabetes and COPD (chronic obstructive pulmonary disease). This makes sense as the devices can easily measure heart function, physical activity and soon glucose levels round the clock. For example, the Zio XT Patch by iRhythm is a patch that detects abnormal heart activity and has FDA approval. In a recent study, the device’s 14 day monitoring of beat-to-beat cardiac rhythm had a 57% greater diagnostic yield than the standard 24 hour Holter monitoring4. The WristOx2 by Nonin Medical is a pulse oximeter that monitors and measures heart rate and blood oxygen levels, and is targeted towards people who have asthma and are at risk of COPD. In 2014, Novartis launched an observational trial with Qualcomm Life collecting biometric data from chronic lung disease patients in their homes using smartphones connected to Qualcomm’s cloud-based 2net Platform. Arkansas Children’s Hospital is using the Fitbit to find connections between sleep, physical activity and asthma in adolescents, conducting the study for 8 weeks on 20 patients. The Medidata MOVE 2014 trial explored the effect of an 8-week intervention combining a mobile app (Medidata Patient Cloud) and a FitBit Flex on health outcomes of overweight patients with Type II diabetes5. An area that has shown promising results and insight using wearables and machine learning techniques is Parkinson’s disease. The sensors in wearable devices can be paired with mobile phone apps to measure symptoms such as tremor, balance, gait, memory and some vocal characteristics. Sometimes only an app is needed - Sage BioNetworks and the University of Rochester are currently collaborating to use the mPower app, which makes the user do tasks such as tapping the screen to assess physical symptoms and track mental ones. The goals are to discover more about Parkinsons and to better track the progression of disease. This involves being able to tell dyskinesia (involuntary muscle movements) and falling apart from normal movements in order to measure their occurrence. Dyskinesia differs from voluntary movements in the fact that dyskinetic movements tend to have lower frequencies and the movements of different body segments are not well coordinated. Classifying it can lead to some technical difficulties – in the Fox Insight study6, it was found that mowing the lawn or exercising can be mistaken for a tremor, and gait parameters can be inaccurate for patients living in a cluttered home. High-quality data analysis and prediction algorithms are needed to accurately make sense or this wearable data. Luckily, many studies since 2001 have using machine learning algorithms such as regression, support vector machines and neural networks to classify tremor, dyskinesia and freezing of gait with an accuracy ranging from 70% up to over 99%. A lot of conditions do not even require the use of a wearable, but just a mobile phone app. Apple’s ResearchKit has kick-started a surge of new apps designed to discover more about various illnesses and conditions7. Duke University’s “Autism and Beyond” uses the front camera on an iPhone coupled with detection algorithms to measure a child’s reaction to videos, with the goal being to aid detection of early developmental diseases such as autism. The “Share the Journey” app for cancer recovery uses iPhone sensors and surveys to track fatigue, mood, cognitive changes, sleep disturbances and reduction in exercise. IBM Watson Health and the American Sleep Apnoea Association have launched the SleepHealth app to conduct a study identifying connections between sleep habits and health outcomes. It will record movement and heart rate during sleep and track connection between sleep quality and daytime activities, alertness, productivity, general health and medical conditions. It will amass the largest collection of sleep data to date. Lastly, GSK (in collaboration with Medidata and POSSIBLE Mobile) are starting a rheumatoid arthritis trial called PARADE8. It will evaluate 300 patients through an app that tracks common RA symptoms such as joint pain and fatigue, and gathers these data through a mix of surveys and sensor-enabled tests (like recording motion through wrist exercises). This trial is not evaluating a drug, but just gathering data on the everyday lives of people with rheumatoid arthritis, to gain insight and learn more about the condition. In theory, wearables can be used to measure quality of life in just about any therapeutic area, where “quality of life” relates to increased movement and improvement in vital signs. They are also the obvious choice for trials where a patient diary is required, as using an app requires a lot less effort than filling out paper questionnaires, and simply wearing a device around your wrist requires even less. The University of Minnesota is currently conducting a trial using FitBit to evaluate the quality of life in 75 brain tumour patients, by monitoring sleep and activity, and PatientsLikeMe and Biogen are using FitBit data to better understand MS (multiple sclerosis)9. Mobility is a critical indicator of the disease (actually this is also the case for many cardiovascular and respiratory diseases) and reduced mobility is often the “first sign that something is wrong”, but typically walking is only assessed in the doctor’s office via the 6-Minute-Walk-test, which paints a very limited picture. MS patients often have trouble walking, which is thought to be correlated to disease progression and it is thought that increasing exercise could slow down progression of the disease. Therefore a wearable would seem like the natural choice to continuously monitor MS patients’ activity in a real-world setting. Another potential use would be to monitor AEs (adverse events), or explain why they occurred – for example if a patient got five hours of sleep then reported a headache or drowsiness. It could also detect the onset of more serious AEs such as depression; for example if a patient suddenly started sleeping more and becoming less active when using the drug. It could uncover patterns for physical effects when doses are missed, and determine if the patient’s activity has any impact on drug efficacy. These examples of possible questions are fascinating and could open the door to a new way of analysing quality of life, adverse events and reasons for the variation in drug efficacy. A recent study10 found noticeable changes in physiological parameters in particular environments, such as airline flights, and could associate this with fatigue. It also found that wearable devices were useful in identification of early signs of Lyme disease and inflammatory responses, and could distinguish physiological differences between insulin-sensitive and -resistant patients. As of September 16th 2016, there were 299 clinical trials involving wearables11, some of them using the device as an intervention but many using it to test the outcome. In a study by the University of British Columbia in Vancouver of 60 patients with knee osteoarthritis, researchers are investigating the value of a three-part intervention including a Fitbit Flex. Wake Forest University conducted a study using the FitBit before and after abdominal cancer surgery, to try and identify patients at risk for surgical complications. Studies are using wearables to measure movement and energy expenditure in stem cell transplant patients, lupus patients and spinal cord stimulation patients. The Embrace watch by Empatica is currently undergoing a clinical trial: this is a new wearable with electrodermal activity sensors that can detect when the wearer is about to have a Grand Mal seizure, and sends out phone notifications to their caregivers. This hopes to combat SUDEP, Sudden Unexpected Death in Epilepsy. So what do the regulatory authorities say? The FDA has released documentation defining and regulating mobile medical devices, but no guidance for their use in clinical trials. The lack of clear regulatory guidelines may be a reason for why pharmaceutical companies are still hesitant to incorporate wearables into their studies. FDA approved consumer devices include the BodyMedia CORE armband and CamNTech’s Pro-Diary and MotionWatch12, both using accelerometers. They are similar to Actilheart and Actiwave devices on market, cleared by FDA to ‘assess activity in any instance where quantifiable analysis of physical motion is desired’. Wearable device manufacturers and pharmaceutical companies choosing between them face several hurdles; if the device is being used to diagnose or treat conditions it will need FDA approval and to comply with HIPAA (Health Insurance Portability and Accountability Act). The FDA needs to regulate products that make specific medical claims and have some risk attached to the treatment. In the case of low-risk consumer devices intended for “general wellness use”, the policy is relaxed and they do not need approval, but the data will still need to be validated to ensure it is reliable and accurate enough to be used in a clinical trial. This all sounds hugely promising - so what are the issues? The first, which was also one of the main reasons to use these devices, is compliance. What if the patient takes off their device or gives it to someone else? We would need to define non-wear: how long we could observe no movement before we count it as “non-wear”. There would also be a need for patient training to ensure the patient does not share their wearable device with others, or even algorithms to detect if they had. There may also be a sort of placebo effect; if patients have a wearable and can see their measurements daily, they may improve their lifestyle or exercise levels just to improve the measurements. After all, this is the main reason people buy wearables – to kick start themselves into improving their health! There would need to be a carefully designed control group in studies where the wearable is only measuring results of other interventions, and isn’t the actual intervention. As well as the patient and trial side, the practical sides of computing and data storage would pose logistical hurdles. Huge amounts of data may exceed the storage capacity of a typical computer system, so it would have to be stored remotely or on an upgraded system. Data security is also a legitimate concern for many patients; companies often sell data if it is classified as “fitness” rather than “health” 13, and patients may be concerned that their data isn’t private. This is also due to the open-source nature of the data, and the fact that unique IDs can be broadcast by devices enabling patients’ locations to be monitored. The final consideration is data validity – accuracy of devices is rapidly improving as technology improves, but some measurements can be quite far from the true value and this can invalidate the results and even pose a threat to the patients. For example, FitBit is facing a lawsuit amid claims that it’s heart rate monitor wildly underestimates heart rate14 – a patient who was training for a marathon and was told not to let his heart rate go above a certain level, claimed that this error could have endangered him. A study assessing the accuracy of wearable devices and smartphone applications against pedometers (the “gold standard”) in measuring step count, showed that while some of the wearables were very accurate, some were up to 22.7% out and smartphones were actually better overall for measuring step count15. Therefore, while many are “good to go” in clinical trials, there is still work to be done on improving the measurement quality and accuracy of wearable devices. It is clear that the multitude of studies currently using wearable devices are producing successful results and gaining new insights into a huge number of diseases, and this is only just beginning. This is an area that has a huge amount of potential. Of course, it faces some problems and issues but if these can be overcome, the use of wearables to measure physical outcomes and monitor patients could make them an invaluable tool in clinical trials. 4 Barrett, P., et al. Comparison of 24 Hour Holter Monitoring Versus 14 Day Novel Adhesive Patch Electrocardiographic Monitoring. American Journal of Medicine, 2014. 6 Machine learning for large-scale wearable sensor data in Parkinson disease : concepts, promises, pitfalls, and futures. / Kubota, Ken J.; Chen, Jason A.; Little, Max A. In: Movement Disorders, Vol. 31, No. 9, 09.2016, p. 1314-1326.